My kid is a picky eater, but there’s one thing that he never gets tired of during mealtime. After a few bites of his favorite snacks or a few spoonfuls of his lunch or dinner, he will always ask for a glass of cold refreshment. For some reason, having a glass of ice cold juice while eating makes him finish his food faster. While he has a current favorite juice drink, that doesn’t stop him from trying other brands that Mommy buys for him. Two weekends ago while doing my grocery shopping, I spotted new items in the cold drinks section of the supermarket. 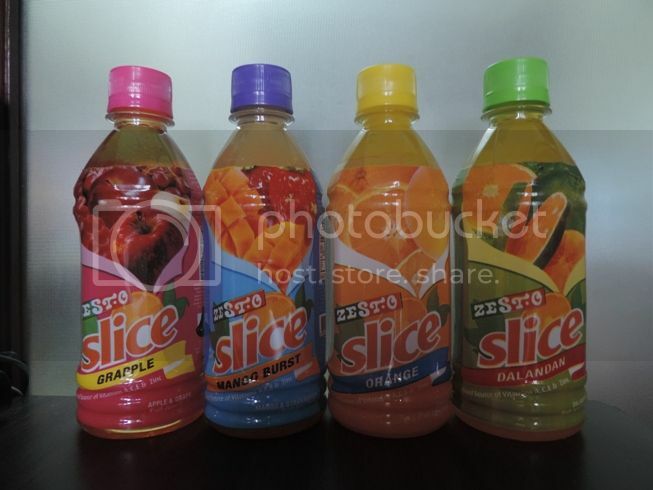 Zest-O Slice fruit juice drinks are the newest products of Zest-O. They come in 355ml bottles, but they cost less than Php20.00. Zest-O Slice has four exciting flavors: Orange, Dalandan, Grapple and Mango Bursts. The Orange and Dalandan are straight fruit flavors that most Filipino consumers like, while Grapple and Mango Bursts are mixed fruit flavors, something playful and exciting for those who would like to try new flavors. Grapple is a combination of grapes and apple, while Mango Bursts is a combination of mango and strawberry. Of the four, my son likes Grapple the most because it’s light and refreshing. Zest-O Slice is not only affordable and delightful; it’s also a good source of Vitamin A, C, E and Zinc that help boost one’s immune system. This entry was posted in Zest-O Slice. Bookmark the permalink. perfect accompaniment to any meal!